Rivers, lakes, mountains, and forests don’t immediately leap to mind when you think of Oklahoma. But in the eastern part of the state, the town of Broken Bow sits adjacent to the sylvan Hochatown State Park, which houses a large reservoir fed by nearby mountain streams. For weekend warriors in cities like Tulsa, Oklahoma City, and Dallas, each about three hours away by car, this represents a refreshing change of scenery. And nothing fits better into a getaway-ready tourist town than a local brewery. Recognizing this niche hadn’t been filled by 2015, now co-owners Mark McDaniel, Charles Wilson, and Keith Shearer decided they wanted to be the ones to bring a brewpub, complete with food and tasting room, to Broken Bow. Such was the genesis of Mountain Fork Brewery, the name owing itself to the pristine nearby river from which the company sources water for brewing. 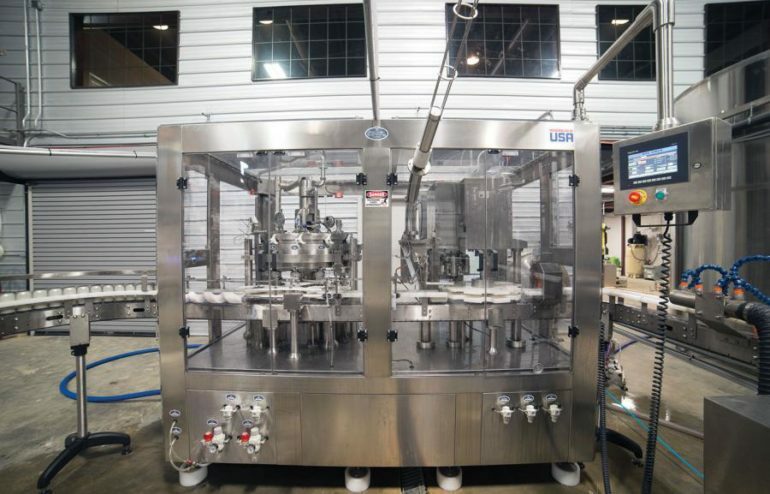 “The front half of the canning line represents one of the first installations in North America of Palmer Canning Systems’ Generation 2, 12/1 (12 filling nozzles, 1 seaming station) canning line. Within this turn-key setup, an overhead depalletizer single files cans and sends them through an inverter, opening them up to an ionized-air deduster. Unfilled cans then enter a Best Code inkjet date coder distributed by Weber Packaging Solutions. Next, cans enter the Palmer 12-head carousel filler and seamer. Cans travel around the carousel and are purged with CO2 prior to filling.